This Display Cabinet Optimizes Retail Space! A total of sixteen lights highlight products for all to see! Built-in-wheels make rearranging or cleaning your store a breeze! 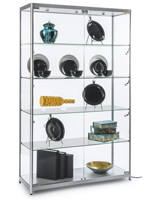 Adjustable shelves accommodate products or trophies of varying heights! 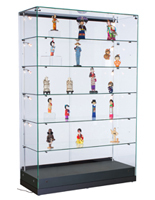 This display case, display cabinet is crafted from tempered glass to extend a secure alternative to traditional annealed glass display cabinets. 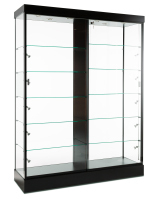 The display cabinet is also well-fitted with wheels for easy mobility and a locking door to warrant only authorized individuals have entrance to exhibited trophies, award plaques, certificates, medals or ribbons. Six 5-watt LED top lights, along with ten micro sidelights warrant trophies, medals and certificates are illuminated at all levels inside the display cabinet. 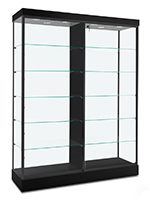 The display cabinet has a center support panel; on each side of this panel are five adjustable tempered glass shelves to suit a trophy or award collection of numerous heights. 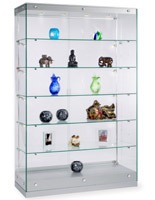 This display cabinet is the ideal method to proudly display your award plaques or other achievements. 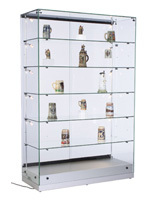 This display cabinet is ideal for a museum, Hall of Fame, hospital, university, or school or business lobby. The display cabinet could also be utilized in a retail store to showcase fine collectibles, electronics, jewelry, watches, handbags and more. This display cabinet is an oversized award case, at 60" wide to suit many award or certificate plaques in a small footprint. 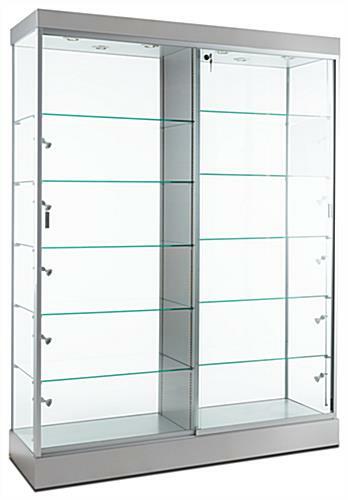 In truth, this tower-style display cabinet is an ideal alternative to counter-style display cases in small or congested retail stores as it takes up much less of these sales floor and surely capitalizing on vertical area.